Looking for great sound quality? Look no further than Inateck! Hey there. Notice how the sound of your portable device is lacking? Doesn't matter if it's the latest model, small phones and tablets just do not pack the punch of full sound quality. That can really put a damper on watching movies on your tablet or playing music through your smartphone. Quite frankly, it simply doesn't work well. Now, there are many portable speakers out there that promise you exceptional sound quality. Some are wired, some are not. Some cost an arm and a leg, others practically nothing but the sound quality is poor. If only you can get exceptional sound quality, wireless and wired connections, a stand, and a tablet/smartphone holder, and all for a low price. Well, my friends, Inateck did it! 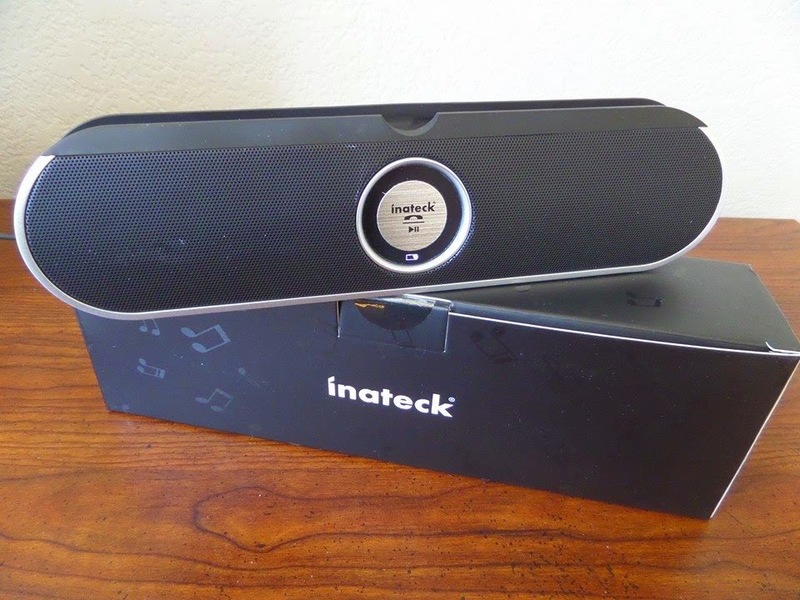 Our good friends at Inateck provided me with the Inateck Portable Bluetooth Stereo Speaker with Stand (Model BP2001) to review and let me tell you that I was blown away by how well it performed. Before I get into my experience, let's talk specs. Now, on to my first impressions. I love the design. Not just the colors but the overall design. I can be a sucker for the silver and black look but I love the "pill" type look of the Inateck Bluetooth Speaker. It's built for optimal sound projection. The silver trim on the underside of the speaker gives it an elegant look. The power switch, 3.5 mm jack, and stand are all on the back and away from view. A single button with the play, pause, and Inateck logo sits front and center. Overall, it's one great looking portable speaker. So lets talk connectivity. I'm a huge fan of wireless connections. I love that all of my bluetooth devices were able to connect with the Inateck Bluetooth Speaker without a problem. In order to connect, you simply enable bluetooth on your device and switch on the Inateck Bluetooth Speaker. More often than not, the speaker connected to my device automatically. I found that pretty cool and odd at the same time. Cool that I didn't have to pair it but weird because if there are several devices with bluetooth wireless connectivity enabled, which one will it pair with? I put that to the test. I noticed that when more than one device is on bluetooth, the Inateck Bluetooth Speaker WILL NOT connect automatically. You will have to manually pair it with your device. Smart move. This will avoid having the wrong device connected. Once connected, a chime will play and you will see the bluetooth symbol light up on the speaker's button. If you opted to use the wired connection, then you have absolutely no problem. Simply plug in the 3.5 mm cable to the speaker and device, a chime will play, the AUX symbol will light up on the speaker's button, and you are good to go. As for the sound... the sound is EXCEPTIONAL. Again, I've used quite a few bluetooth speakers but this Inateck Portable Bluetooth Stereo Speaker is above the rest. The sound is crisp, the sound booms, and the sound projects extremely well. I tested the speaker in an indoor and outdoor setting and twice my wife told me to turn it down because it's too loud. I guess blasting Five Finger Death Punch in the front yard is not ideal for everyone. lol Anyways, indoors, I was able to hear the sound project well into the second story of my house. And while outside, the whole family was able to hear the music play while doing yard work. I can definitely see me using this speaker as a quick and efficient way to get music playing practically anywhere. And because I can control the music and volume from my device, I can easily turn up and switch the music with a tap of the screen. Big kudos on the sound quality, Inateck! Now that I know just how well sound projects from the Inateck Bluetooth Speaker, I wanted to add visuals to test the movie watching experience with the speaker. The cradle on the top of the speaker easily accommodates a tablet of practically any size. The cradle is open ended so the tablet or device can extend well past the length of the speaker. The cradle is lined with a soft rubber so inserting a tablet will not damage, scuff, or scratch the screen but most importantly, your tablet will not fall off the speaker or tip over. Especially if you have the stand extended. The stand creates a more stable setting for your tablet and just adds to your sense of security that your tablet is safe. This makes it perfect for watching a movie. The table angles perfectly for optimal viewing and because the speakers have such a rich sound, you will end up getting a pretty good movie watching experience. Another big plus for Inateck! The tablet cradle is open ended to accommodate any size tablet! The last feature that I tested on the Inateck Portable Bluetooth Speaker is the ability to answer calls while connected. In essence, you can answer a call and the conversation will play out from the speaker. Mind you, I don't see much use for this feature. It's basically allowing everyone in the room to hear your conversation. Nobody wants to hear that. The only way I see this being useful is if someone is calling in for an announcement and everyone should hear it. Or, if you are doing a podcast and have more than a few friends that would like to listen to the show play live. Other than that, I simply don't see myself answering calls while connected. The only downside that I was able to find on this otherwise great portable bluetooth speaker is a minor one. The Inateck Portable Bluetooth Stereo Speaker does a horrible job at letting you know when it needs to be charged. When plugged in to charge, a charging indicator light will come on... but the indicator is set at half charge. 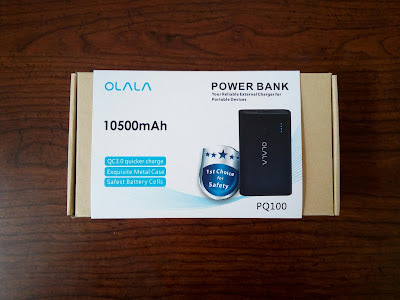 So there is no way to check how much is charged or once it's fully charged. And during playback, the only way that you'll know that it's time to charge is if your devices drops connection to the speaker for short periods of time. I found that annoying at first. I thought that maybe my phone was acting up. I thought that maybe my wifi was dropping my signal. It wasn't until after several moments of frustration, and music coming on and off, that I realized that it needed to be speaker needed to be charged. It would have been great if the charging indicator turned red or something like that BEFORE you start to lose connection but that's doesn't happen. So if you noticed that you are losing connection to your Inateck Portable Bluetooth Speaker, it's probably because you need to recharge. And speaking of charge, once the speaker is fully charged, it is good to go for about 5 hours before needing to recharge again. So there you have it, the Inateck Portable Bluetooth Stereo Speaker with Stand is one great portable speaker that you must check out. It has everything that you want! Exceptional sound, good looking, wired and wireless connectivity, rechargable lithium ion battery, a tablet cradle, and a stand. And guess what... you can pick one up right now at Amazon for $29.99. That's right. It's under $30! That's pretty awesome if you ask me. It's hard to get a product with such high quality for a reasonably low price. Make sure to pick one up before they are all gone! Later!